If you are trying to increase traffic for your blog, you may always optimize your site with proper and better Search Engine Optimization (SEO) techniques. The obvious reason is to grab more attention for your pages via organic search. However as an opportunity for authors, Google has rolled out authorship feature to promote yourself in Google search results. But when it comes to Blogger, it was lack of important SEO features such as specifying page / post descriptions which displays beneath search results. Search descriptions are really helpful for visitors to decide whether check it out or not. But Blogger users were helpless in this scenario because they couldn't specify post descriptions by their own. Therefore search engines are liable to decide what should be displayed as the description in search result. Mmm... What if you could specify your own search description for your individual posts? Finally, Blogger rolls out another important feature for users from SEO point of view. Now Blogger let you specify your own search description for your posts without being worried about editing your template or whatsoever. Earlier users who wanna optimize their post descriptions had to put tremendous effort on it while most others just let it be. And it was a big disadvantage for Blogger users as it wasn't able to chosen by users what to show off as the post description in search results. However at last Blogger made it so easy for their users and I think users never miss this one. This will be a huge advantage from the aspect of SEO and it's a big turning point for Blogger users who were suffering from inadequate traffic for their quality content. Further, as a plus point, the description will be available for posts being shared on social networks such as Facebook. So users don't need anymore tricks on it as they did when there were no description attached while sharing on social platforms. * You need to check your template for the availability of below code snippet in it. If it's not available in your template, add it right after <head> tag. Note: If you don't know how to view and edit your template, read How to Edit Your Blogger Template. * You need to ensure that you have search description feature enabled for your blog. If you didn't or not sure about that, read How to Add Search Description for Your Blog in Blogger and have it enabled. 3. 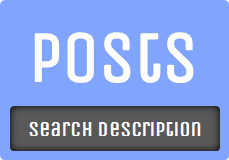 Navigate to Posts tab from left pane if you wanna apply search description for existing post. Else click New post button to start with new post. 4. Take a look at Post settings on right sidebar and click on Search Description setting. 5. 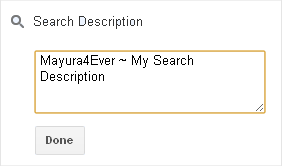 Now add your post search description in the visible text box and click Done. 6. Update your post if you are referring to existing post or else Publish after completing your post if you are writing up a new post. This is very important info for blogger blogs Mayura, nice job! Can it also be done in the newer design templates in Blogger? This is SO helpful and easy to follow! It works for me. Thank you so much!! You're so welcome dear and glad you made it for your blog. Descriptions are really worthy when it comes to SEO and social sharing. Did you check for the code snippet in Before You Go Section? :) And if you have added a description meta tag manually for your blog earlier, you have to remove it to reflect new descriptions of your posts dear. Do u know what I should do? I had a look at your post and description is correct though. This is what I read ~ "I try to find excuses to meet you, I want to be the reason behind your smile, I want to spend my whole day with you,every day"
Keep using search descriptions. BTW if you have any issue when sharing to Facebook, you may find this post helpful ~ Why Link or URL Preview Not Working on Facebook? I seriously can't believe it :o it's working now!!! Most welcome! Ha ha... Sometimes they do behave weirdly eventhough you had things in order Kaarunya :) Same happened to me few times.